The granules milled from various whole grains, such as corn, rice, buckwheat or hard wheat, are known as semolina. These granules are further ground into varying sizes and used to make a variety of foods, including bread, pasta, pudding and porridge. Finely ground semolina milled from hard wheat is the type used to make porridge. It's often packaged as farina, manna groats, or cream of wheat. With your choice of toppings, a bowl of hot semolina porridge makes a hearty meal any time of day. Bring water or milk to a boil, stirring occasionally. Slowly add the semolina to the boiling liquid, stirring constantly with the whisk. Follow your porridge recipe for exact amounts of semolina and flour. Typically, you would use 1/4 cup of semolina for every cup of liquid. The more liquid you use, the thinner the porridge. Use less liquid and you'll get a nice, thick porridge. Cook for 1 to 2 minutes, stirring the entire time. Lower the heat, cover and simmer until the mixture is smooth and creamy -- approximately 15 to 20 minutes. Stir every few minutes to ensure the porridge does not stick to the bottom of the saucepan. 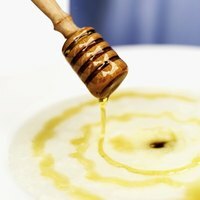 You can add sugar to sweeten your porridge. Remove the porridge from the heat and serve. You can enjoy your porridge as is, or top it with whatever suits your taste such as brown sugar, cinnamon, honey, butter or fresh fruit. For a savory taste, don't add sugar, but instead add salt and finely shredded cheese once your porridge is done cooking but still hot. Saute finely chopped cashews and add them to your porridge at the start of cooking for a nutty taste.